We made it in last night after a great sail from Tonga - 9 days from Neiafu. The wind had died just after NZ appeared over the horizon so we motored the last few miles. New Zealand Customs have a formidable reputation. We had all the fresh food segregated and the forms and paperwork completed before the Customs came on board, so formalities were completed in about half an hour. Once we had cleared we met up with Matt and Katie from Lionheart who treated us to a cooked breakfast - which was much appreciated. 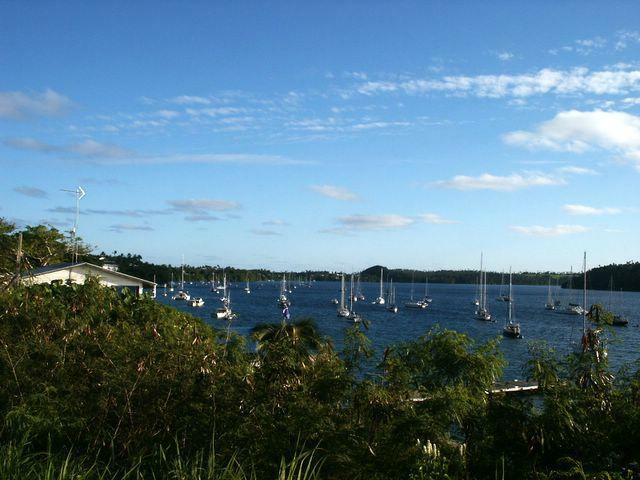 The marina is excellent - it has loads of room and is very well constructed. There are many chandlers and workshops around. Today we arranged to have a new sprayhood cover made (the old one got damaged on the way down), some minor sail repairs done and also arranged for a rigger to come down tomorrow to look at the headfoil (the alloy extrusion over the forestay that takes the jib). We've had this jury rigged for some weeks. There is much else we would like to do, but that is the priority stuff. After 9 days at sea we are really enjoying being ashore and meeting the sailors who made it down ahead of us. We are well on our way - about 550 miles to go. So far weather has been fine, especially since we cleared the front on the first evening out. We have been close reaching in 20-25kts for most of the way. The forecast is pretty good for the next few days - with a bit of luck, the wind will free off and we will have a nice reach in. Even though the sail down from Tonga has been really good - and far easier and faster than expected - we haven't long to go now and we are really looking forward to getting in! Henri finished the flag today and we've been completing the paperwork and lists of stores to facilitate customs. Even the pilotage for the trip up the river is done! We caught a smallish tuna, it was very welcome - we now have something to add to the rice, potatoes, tinned tomato and kidney beans which is all we have left on board. We have spent 2 weeks and 2 days in Tonga, mostly in the superbly protected Neiafu anchorage. The anchorage is full of boats waiting, and more arrive all the time. Every Friday there is a harbour race for cruisers, which we entered on the day after arriving. Our twin jibs were our secret weapon as no spinnakers were allowed. We rounded the windward mark a boat length ahead of a competitor, and with our jib suddenly doubling as we rounded, we went on to gain a half leg advantage by the leeward mark. There were two clues as to the standard of racing among the cruisers - one at the start when when 9 out of 11 boats chose to start on port tack at the wrong end of the line. The other was at the end, when we came third, having been beaten by the cruiser who sailed the dinghy course and then motored over the line! Great fun! The local shops and dive concessions put up the prizes which makes for a great event. We won a introductory dive which we really enjoyed, it was our first time diving and is something we would like to do more of. More and more the conversation among the cruisers is about the trip to New Zealand. The passage needs to be treated with some respect as there is a potential for strong winds, particularly close to New Zealand itself. Most boats will take over a week to get there, and with reliable forecasts going maybe 3 days out, there is a lot of uncertainty about what constitutes a good window to leave. The weather has been unsettled for the last week - some days have been grey and rainy all day long. We will leave in the morning on the trailing edge of a front, which should mean we will get a bit of a boost from strong winds, and will have an improving outlook for the following 3-4 days. We are going from Neiafu directly rather than from the more usual jumping off point of in Tongatopu (the southernmost island group - about 170nm away and closer to NZ) since the conditions are right and the overall trip is shorter.